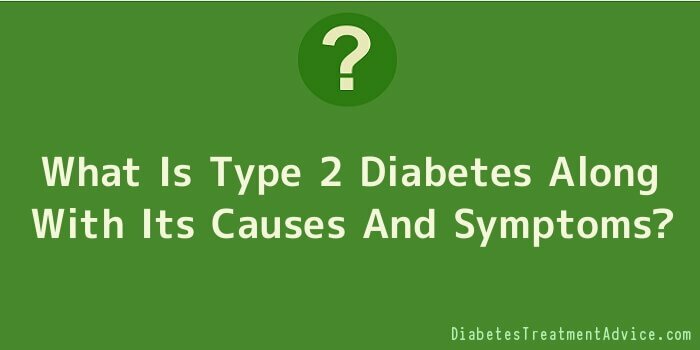 What Is Type 2 Diabetes Along With Its Causes And Symptoms? Type 2 diabetes is actually more common than the other two types, which are Type 1 and gestational diabetes. In fact, if you would take time to look at the stats and figures, you would see how this type of diabetes is prevalent amongst so many continents. This type of diabetes is even close to epidemic proportions already. This can be attributed to the fact that there is an increased number of older Caucasians and Americans in society, as well as an increased prevalence of sedentary lifestyles and obesity. So, what exactly is type 2 diabetes? This is actually a metabolic disorder that is the result of the human body’s inability either to produce enough insulin or to properly use the same hormone. Type 2 diabetics are not really dependent on the hormone insulin, which is why the condition was once popularly known as NIDDM or non-insulin-dependent diabetes mellitus. Because the amount of insulin is insufficient in the body, and because the body itself is unable to properly utilizes the hormone, then glucose or blood sugar is not properly delivered into the cells of the body. But what are the exact causes of type 2 diabetes? The exact cause remains unknown to this day. However, much diabetes research has been done, and it has actually been determined that genetics just might be a factor for the condition. Still, you would have to contend with another factor or trigger that can bring about the disorder, even if you are already predisposed to it. For instance, let us say that diabetes does run in your family. This means you have the genetic predisposition to develop type 2 diabetes yourself. However, this does not mean that there is a hundred percent chance that you would indeed develop the condition. This is because it takes another condition or factor to trigger the onset of the condition. The usual trigger here is obesity. The symptoms that come with the condition include frequent wounds and infections that do not heal easily, high glucose levels in both blood and urine, excessive thirst, extreme hunger, nausea, frequent urination, significant weight loss, extreme fatigue, mood changes, irritability, dry skin, and blurred vision. There are other symptoms, but these are the more frequent ones. Interestingly, not a lot of people realize that they are already afflicted with the condition. This is because the symptoms of the condition can easily be mistaken to be symptoms of another condition. Take fatigue, for instance. If you have been feeling extremely weak, it is quite easy for you to think that this is just due to stress. However, if you cannot pinpoint an exact reason behind this extreme fatigue, then you should have yourself tested for type 2 diabetes.